The College of Engineering offers tutoring services in several courses from pre-engineering subjects related to math and science, as well as some of the sophomore-level supporting courses. We offer individual and small-group scheduled appointments, as well as (new) drop-in evening tutoring for core calculus and physics courses. Read below for more information! Spring 2019 tutoring will begin on Tuesday, January 22, 2019 and end on Wednesday, May 1, 2019. Appointments are required for individual and small-group tutoring sessions through Advise Assist. Appointments are not required for evening drop-in tutoring in core calculus and engineering physics. The drop-in sessions will be held in 1210 Shelby (the Engineering Student Services office). See the schedule (above) for more information. Tutoring appointments canceled less than three (3) hours in advance of the scheduled appointment time will automatically be considered a NO-SHOW. Any Tutor Center client (student) with two (2) or more no-shows in a 30-day period will be blocked from making future appointments. If a block preventing appointments is in place, please see the Tutor Coordinator to request a reset of your no-show counter. The tutor coordinator accepts appointments through Advise Assist (or drop-in appointments based on availability) in the Engineering Student Services (ESS) office, 1210 Shelby. Individual Tutoring: Appointments are required. Students can make a maximum of four appointments a week. Tutoring sessions are free to all engineering students and are scheduled according to the availability of a tutor for the required subject. Group tutoring: Group appointments are available for a maximum of four students per subject. Use Advise Assist to sign up. Drop-in tutoring: No appointment is required for these core calculus and engineering physics tutoring sessions. See the schedule above for more information regarding when you can drop in for each course. Students check-in at 1202 Shelby Center at the appointment time to meet with the tutor. Students check-in at 1210 Shelby Center on the kiosk by the front desk. Tutors are not permitted to do your homework, so come with prepared questions. Bring your textbook and notes to the tutoring session. Cancellations for tutoring must be done as early as possible prior to appointment through Advise Assist. Failure to do so will result in the appointment being marked as a No Show. Two No Shows in a semester may result in loss of tutoring privileges for the remainder of the semester. Questions about Engineering Student Tutoring, may be sent to tutor@eng.auburn.edu. Access to Shelby is not restricted until 9:30 pm You should not need card swipe access to access tutoring the building, but if you are an engineering student and would like to request access to Shelby, you should request it here. The College of Engineering offers tutoring services in several courses from pre-engineering subjects related to math and science, as well as some of the sophomore-level supporting courses. We are now accepting applications for tutors for Summer and Fall 2019. MUST be an undergraduate engineering student. The application requires you provide the name and Auburn email address of a College of Engineering faculty member or advisor willing to provide a recommendation. Once you provide the email address, we will contact them with a short questionnaire. Please arrange this with the person whose information you provide before submitting the application. I graduated from high school in Smyrna, Ga. in 1970, where I had gone to school from kindergarten through 12th grade, and I was accepted to Auburn University in Fall 1970 to study civil engineering. Throughout my academic life I made A’s and B’s by simply paying attention in class and doing my homework (which was minimal in retrospect); I seldom had to study, and I frankly thought that was the case because I believed I was smarter than the average kid (though certainly not the smartest kid in the room.) I made straight A’s during my senior year in high school, and headed out to Auburn prepared to get my engineering degree and enjoy the college scene. In my first quarter at Auburn, and throughout my freshman year, several subjects I was required to take proved to be quite difficult for me because I came from a school system that allowed me to essentially memorize answers instead of teaching me how to study and truly learn the material. Auburn also exposed me to large classrooms for the first time, where one- on-one instruction during class was virtually impossible. As a result, my weaknesses in the classroom became all too obvious in the pre-engineering preparatory courses like chemistry, calculus, physics, etc. I will never forget struggling mightily in studying for my first calculus and chemistry tests (both in the same week early in my first quarter), and getting my test papers back with scores of 62 and 65, respectively. Never before had I even studied much to make A’s and B’s, and suddenly I had worked as hard as I knew how and ended up essentially failing two different tests. I had a sinking feeling in my gut that I would flunk out of college by the end of my freshman year and perhaps sooner, and suddenly the college scene was no longer fun. Out of desperation, for the next week or so I went to see my professors for each of my problem subjects after each class , and while they were helpful as to specific questions I had, my lack of a sufficient academic background continued to plague me and destroy what little confidence I had remaining. Finally (probably to get me off his back), one of my professors suggested that I sign up for the tutorial program that was available to pre-engineering students. I was directed to the west end of Ramsay Hall on the first floor to sign up for a tutor in each problem subject, and I initially signed up for one hour of tutoring (by a graduate student or upperclassman) for each hour of class. Much to my relief the program was funded by an annual donation from an Auburn University graduate and therefore it was free to kids like me who were going through school on a shoestring and a prayer. The one-on-one instruction I received during these sessions allowed me to learn how to think like a problem solver, how to reason through the solutions to a problem, how to study the available material efficiently, and essentially gave me confidence in myself again through the immediate feedback that I could get from the tutor. While it continued to be a struggle for me through the first two quarters at Auburn, I no longer needed the tutors by the end of the second quarter, and I ended up with a GPA of 3.5 or better in both quarters. Ultimately I graduated with high honors with an overall GPA of 3.78 four years later, well ahead of many of the students who had seemingly thought that tutors were for the dummies in the class. Since graduating from Auburn, I worked four years with Exxon Company, USA in New Orleans, and then for seven years with a small independent oil company where I became the executive vice president and chief operating officer. In 1985 I started my first oil and gas company at the age of 32, and since then I have initiated a total of six different companies that were all ultimately sold off at a profit to larger industry competitors who liked the niche’s we were pursuing. I reside today in Tulsa, Okla. where I have been for the last 29 years, and I am on the Auburn Engineering Advisory Council (who graciously honored me with the Engineering Achievement Award in 2004). 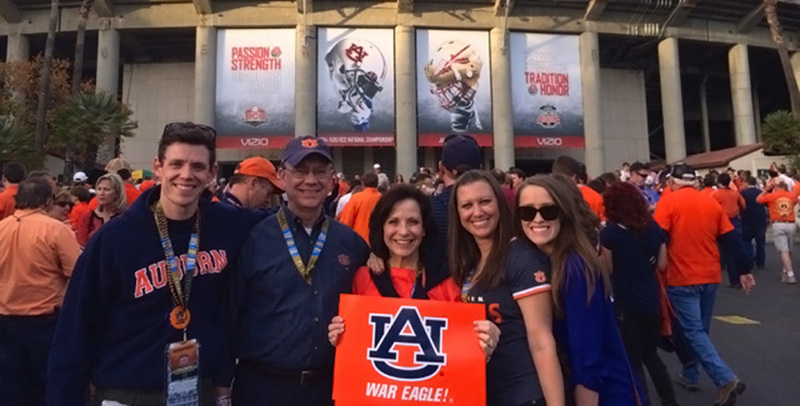 I currently serve on nine different company or charitable boards, and my wife Becky and I have four kids (three of whom have degrees from Auburn). In retrospect, if it hadn’t been for the engineering tutorial program at Auburn in 1970, I feel certain that I would not have been able to pull myself out of the tailspin I was in during my first few months on campus. I would likely have changed to a different major and perhaps even gone to a smaller college or dropped out altogether. There is no doubt Auburn changed my life forever, and therefore the tutorial program that saved me allowed me to become the person I am today, and to experience the success I have been fortunate enough to enjoy. With this background, it is important for me to give back to Auburn and to perhaps provide a similar life raft for those students who like me are not initially prepared for the rigors of an engineering degree. My wife and I are very proud to be able to fund the Warnock Family Tutorial Fund for Excellence, an endowment that will help pay for this program. If you are unable to schedule a tutoring appointment with engineering tutors, there is tutoring available from Study Partners, located in the library as well as the Math help center in Parker Hall. The math department has also provided a list of private tutors available for hire.